Jaymes Diaz of the Liberal Party did not have a good time on the first day of the campaign trail. TODAY IS THE first day of campaigning for the upcoming Australian election. 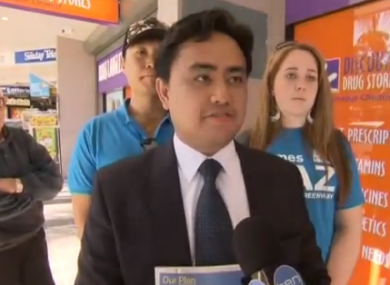 One person out on the campaign trail was Jaymes Diaz, a Liberal Party candidate for the Greenway district, a northeastern suburb of Sydney. The Liberal Party is Australia’s center-right party, and Diaz is hoping to take the seat from incumbent MP Michelle Rowland, a representative of the center left Labor Party. Diaz had a very bad day. Below you can watch an interview between Diaz and John Hill, a reporter with Australia’s Channel 10. Asked about the issue of asylum-seekers arriving by boat, Diaz told the reporter that his party had a six point plan to deal with what he described as a problem created by Labor. Unfortunately, he was unable to describe a single part of this plan, despite being asked multiple times. This wasn’t the only gaffe. Diaz was clearly stumped when the reporter said that a paid parental leave scheme proposed by his party relied on a corporate tax increase, and a party handler stepped in to stop the interview. This unedited version of the video (embedded below) reveals just how awkward the exchange was. Between 3.30 and 4.30, Diaz is asked eight times by the reporter to name the other points in the asylum-seekers plan (at one point even the stoic Liberal Party supporter behind him appears to be holding back laughter). The video has already gone viral in Australia, and The Australian notes that Rowland’s press team had uploaded it to YouTube less than an hour after it first aired. Email “Australian political hopeful stumped during disastrous interview”. Feedback on “Australian political hopeful stumped during disastrous interview”.